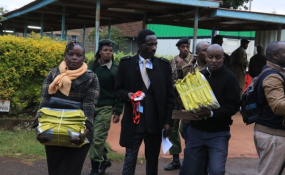 Teachers and principals collect Kenya Certificate of Secondary Education exams outside the Nyeri Central Sub-County headquarters on November 5, 2018. Nairobi — This year's Kenya Certificate of Secondary Education (KCSE) examinations will start tomorrow in schools countrywide. Students have been undertaking practicals which are usually administered two weeks before the actual main papers. According to the Kenya National Examinations Council (KNEC), a total of 1.6 million candidates will sit for the theory papers set to end on the 28th of this month. The examination body's chairman George Magoha has assured that there will be no delays during the exercise, which is likely to face challenges in parts of the country due heavy rains--particularly in the coastal region and parts of eastern. The candidates will start off with Mathematics Alternative A and B, and Chemistry Paper 1 and 2. On Tuesday, the students will sit for their English functional skills, hearing impaired, comprehension, literary appreciation and grammar. Rehearsals for the papers were conducted last week on Thursday and according to the education ministry, everything has been put in place to ensure the exercise proceeds with no hiccups.